Last week’s analysis of Silver expected more downwards movement towards a target at 18.591 to 18.353. Price did move lower but has failed to reach the target. Downwards movement may have ended at 19.595, 1.004 short of the target zone. Minor wave B is now a complete zigzag. Minute wave c is now a complete impulse. Within minute wave c there are no adequate Fibonacci ratios between minuette waves (i), (iii) and (v). The narrow channel drawn about minute wave c is drawn using Elliott’s first technique. Draw the first trend line from the ends of minuette waves (i) to (iii), then place a parallel copy upon the end of minuette wave (ii). This channel is now clearly breached by upwards movement which indicates minute wave c is over and the next wave has begun. The upper edge of the channel is now providing support. Within minor wave C no second wave correction may move beyond the start of its first wave. This wave count is invalidated with movement below 19.595. At 26.50 minor wave C would reach equality in length with minor wave A. What is very clear on this hourly chart is the three wave structure for recent downwards movement. If price does not break below 19.595 then I would expect a third wave upwards to begin from here. Upwards movement for minuette wave (i) is very clearly an impulse. Ratios within minuette wave (i) are: there is no Fibonacci ratio between subminuette waves iii and i, and subminuette wave v is just 0.006 short of 0.618 the length of subminuette wave iii. Within minuette wave (ii) subminuette wave c is 0.031 short of equality with subminuette wave a. 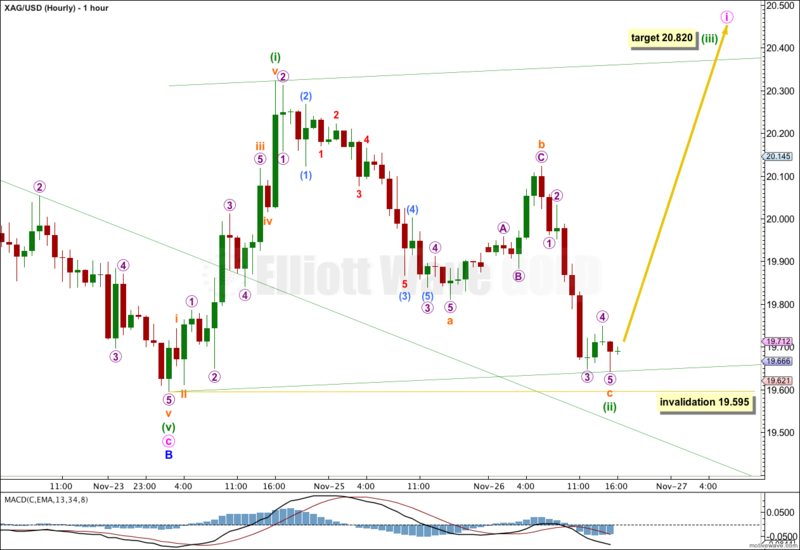 At 20.820 minuette wave (iii) would reach 1.618 the length of minuette wave (i). The channel about minuette waves (i) and (ii) is an acceleration channel. I would expect minuette wave (iii) to break through the upper edge of this channel. At that stage I would be confident that a third wave is underway. So, does this morning (12/04) mark the turn back up? I think today was a great example of why 95% of all traders loose money regardless of the techniques they employ. Fortunately i chose the invalid route. I think today was a great example of why alternate wave counts are important. If the main wave count is invalidated then an alternate can provide a map explaining what should happen next. I have had an alternate for Gold, and the same idea works for Silver, but I have not updated the analysis for Silver yet. I’ll be doing that today. I agree Nixie, it’s really good to see the comment section taking off like this. That’s why Lara started it so we can all chat about the trades. I hope it can continue, we can all benefit from each other. K2ashley are you trading options? Hope you don’t think that is to personal. Was just curious since you said you doubled your money. Good job! I trade shares but i also Spread bet now and again. I doubled my money on spread betting gold and silver on a tight stop.With the combined trades i won £240 over night, so i just took the profit. I only Spread Bet on a guaranteed stop, that way i know exactly how much i can lose. Don’t think Lara is saying the bottom is in yet John. So don’t go thinking you’re wrong. We may well have that big down leg yet that’s going to get the Gold bugs to give up and sell their Gold. At that point and with Lara’s help we can all get in around the bottom. But remember when you hear things in the media that is doom and gloom about Gold and Gold Bugs are arguing and bickering amongst themselves, probably on a strong move down on Gold, then to me that will be the bottom. When every one else is panic selling then we will be buying. I agree lara’s Gold is in rally progression right now. But my target is 1295 (just current wave 4 level), and than go back down looking for last bottom, it should be below 1180 to form new low. it is main wave V. After finishing main wave V, I agree price pattern like that Lara describe in her published. at least 3-4 cycles from 1100 – 1500 to finish bottom consolidation, the period need one more year. Okay, I’m leaving your comments up because they seem to be generating discussion amongst members. For this reason only do I see your comments as having any value because I want members to communicate with each other daily, to help each other out. But… and this is a big but… I do not see any value whatsoever in your comments. As I’ve said before, you are offering random opinion only. First… you told me that I was wrong and that is was “impossible” that gold could to up, it must crash. Now you’re telling me the target is wrong and you expect only 1,295 to be reached. But again, you offer no reasoning, no link to a chart, no analysis to back up your opinion. Which makes your opinion completely valueless. It’s just a random internet opinion. It looks like you may be considering some other wave count, but without a link to a chart we can have no idea what it is in order to judge for ourselves if it has any merit. If we used random internetz opinions from which to base our trading decisions… we deserve to lose all of our money. So I’m asking you again, most strongly this time, back it up with reasoning. A link to a chart. Technical analysis. Even fundamental analysis. Something. You are right, Lara. Thanks for your good idea. Well I’ve more than doubled my money and now taken profit. Thanks for your input Lara. I’ll admit straight out I’m a novice when it comes to technical analysis with lots to learn. However, I have made a couple of observations. Sometimes you have to go by feel. If a commodity or stock doesn’t have that right feel to it I’ve learned the hard way don’t make a move. Silver right now, for me, doesn’t have that feel. A more practical and observable thing is an extended wick on the candlesticks. I call this the Beethoven moment. (Think of the opening movement of Beethoven’s Fifth Symphony.) Whenever one occurs it signals a change in direction. The most recent occurred on October 14th signalling a turn upwards for silver and the last on October 29th signalling a turn downwards. I haven’t seen an extended wick the past few days. Therefore I would say that silver is in a minor correction upwards perhaps to Lara’s target of $20.82 before falling down again perhaps to her previous low target of $18.353 to $18.591. Due to the negative comments on Gold & Silver, i went long both Gold & Silver last night with my stop just below Lara’s invalidation level. I thought this worth the risk, because the stop loss is so near and when people start saying the word “crash” i think we may be due a rise. If i’m wrong I’ve lost very little. If right i’ll move stop up to break even and let it run. Yeah, when everyone says “sell!” then maybe it’s time to buy. And you’re absolutely right, it’s low risk. The invalidation point was really close. think i’ll sit this one out until the main 2nd wave correction of your $20.8 target. If its a valid one, then a 50%-61.8% correction should be likely back to $20.2, don’t you think? ..or is a shallow 2nd wave possible?? That is certainly a lower risk approach. It’s a pretty big trend change, so waiting for confirmation is a good idea. Second waves are most often deep, but they don’t have to be. I’ll be watching proportion and structure and using channels to try and anticipate when it is done. John. I can see where you are coming from. But, I do feel that the scenario you describe has a much lower probability than Lara’s. Indicators and candlestick pattern give a glimpse of this. Stochastics are near zero. RSI is in the oversold zone. And prices have not breached the lower end of the bullish engulfing candlestick occurring at the end of Minor B, strongly suggesting its validity and point to a trend change, which is the Minor C wave. If I am not wrong, the scenario you describe is one in which Minuette wave 5 of Minute C of Minor B has not ended (at the bullish engulfing candlestick). Rather, it is labelled as Sub-Minuette 1 of Minuette 5. In this case, Lara’s Minuette 1 of Minor C (at 20.35) becomes Sub-Minuette 2 of Minuette 5. Today’s low is 19.65 (which Lara has labelled as Minuette 2 of Minor C). Now, as Lara has stated very clearly, the next thing to see is the invalidation point at 19.595. If prices continue to fall below that, you are right, and your Minor B will terminate around 18.43. (This makes Intermediate wave C a regular flat correction, which had been the thinking all along). We have to consider the probabilities of each possible scenario. If prices rebound from 19.65, then Lara’s current analysis is right. If not, 19.595 is invalidated, and Lara’s insightful analysis has also considered that possibility. Due diligence means that we have to look at all the material facts and evidence, and draw feasible inferences. One should not form an impulsive random opinion. $19.58 now for Kitco Silver. Is $0.015 enough to invalidate the above wave count? My data shows silver has not moved below 19.595, it has reached 19.625. 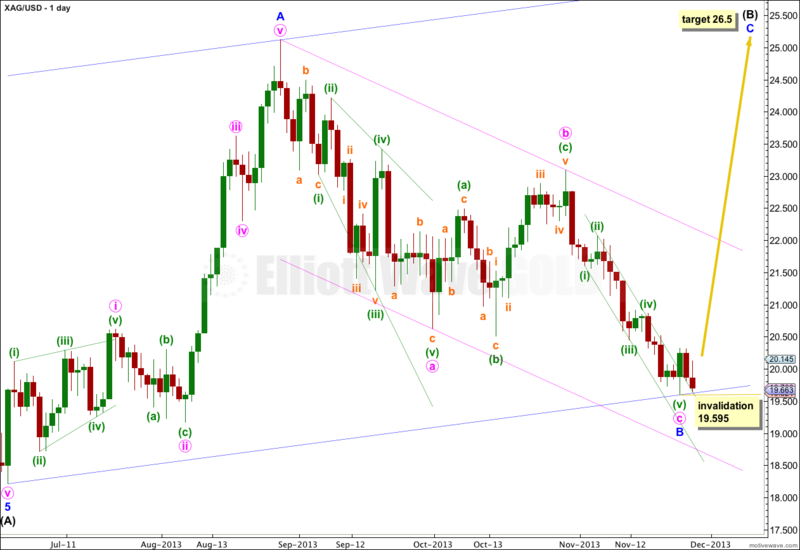 Silver has not broken Monday’s low for my data, and thus the chart/count is still valid. These slight differences can slightly alter the fib points too, but those are approximations anyway. and to answer your question, yes, if that is the low then that is enough to invalidate the wave count. I have just published an alternate for gold which looks very good. I have checked the idea on Silver and it works there too. Thank you for your responds. I wish you are right, but the price will direactly reach $25 from here is impossible. Most possibility is a correction happening to reach $ 20.8. will see. You are most welcome to your opinion and I am very happy to listen to analysis which disagrees with mine. However, you are offering opinion only with zero analysis to back it up. You are not stating any reasons for your opinion. Your comments add nothing to this analysis of either gold or silver markets. Unless you back up your opinions with analysis of some kind then further comments will be deleted. actually silver and gold large crash will be coming soon. That’s fine that you disagree with my analysis. However, you are offering an opinion with nothing to back it up. What makes you say Silver and Gold will crash / move lower? A link to your analysis or an explanation of your reasoning is required to make this anything other than a random opinion. you mean Silver and gold are bottom in place, is it right? I think it is hardly to say that.